The headstone, which is made of black granite and set in Rotis, was unveiled just over three years after Wilson passed away; one could probably make a reference to Saville delivering Factory gig posters after the actual gig. It does not have a Factory catalogue number, as Wilson's casket, FAC 501, was the last one ever to be issued. Recycle: Joy Division & New Order; a record collector by the name of DJ £50 Note and a friend of his who specialises in sound restoration have set out to do what Rob Gretton was planning to do before he died, i.e., put out definitive editions of New Order's entire Factory-period output, sounding exactly as the originals did (and not "remastered", i.e., compressed for extra attention-catching loudness, as is the standard commercial practice now). He is doing this as a MP3 (well, .m4a) blog, with each release accompanied by meticulously restored artwork (with elements redrawn and reset as needed), and comprehensive notes, in which, for example, we learn that the choir sound in Blue Monday was sampled from a Kraftwerk track and comes from an extremely obscure instrument called the Vako Orchestron, and that a number of New Order/Joy Division song titles are film references derived from old posters in a rehearsal space, as well as details of how far back they had to look to find a copy in which the dynamics hadn't been crushed to hell. 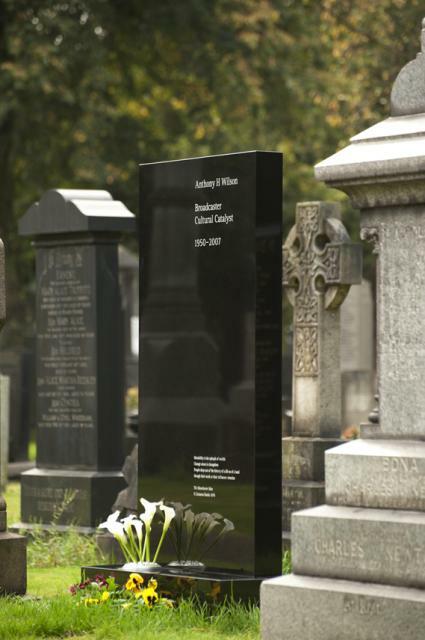 When Factory Records boss Tony Wilson was buried recently, his coffin was numbered FAC 501, the last Factory catalogue number. Tony Wilson, founder of groundbreaking independent label Factory Records, has passed away at the age of 57. Wilson was responsible for bringing Joy Division/New Order to the world's attention, and arguably kickstarted dance/club culture in Manchester by opening the Hacienda nightclub (the first US-style superclub in Britain). Obituaries at the BBC, The Guardian (written by Paul Morley, no less), and Pitchfork. Update: Momus has a tribute to Tony Wilson; he, of course, is full of praise for the great man, and also reveals that "Hairstyle Of The Devil" was about a (bizarre) love triangle involving himself and Peter Saville's ex-girlfriend Nicki Kefalas, who was handling Factory's promotions. I wonder whether this (and the album's somewhat mechanistic title, "X&Y") means that the band, known for their unchallenging and somewhat schmaltzy easy-listening balladry, are attempting to go for a cold-and-detached aesthetic; perhaps to appeal to nostalgic late-thirtysomethings who grew up listening to Factory Records bands but have since mellowed somewhat. Mind you, if they take it too far, it could alienate their fanbase (ironically enough, the band they were groomed by the press to replace after they went too weird, Radiohead, did something much like that). Then again, I'm sure the band and their label know which side their bread is buttered on. Perhaps this means is that there will be a veneer of retro-fashionable electronic glitchyness grafted over the usual reassuringly saccharine core of ballads. I'm listening to The Wake's Harmony and Singles (the LTM repackaging of the stuff they recorded for Factory/Factory Benelux in the early 1980s). They sound very much like New Order circa Movement, down to the drumming sounding identical in places, with similar digital reverb, the same keyboard sound, and angsty, ambiguous lyrics delivered with Caesar's Bernard-Sumner-imitating-Ian-Curtis-esque vocals. It's much in the way that early In The Nursery sounds like Joy Division, only more so. It's funny to think that they're the same band who released Tidal Wave of Hype, an album of Blueboy/Field Mice-style jangle-pop with baggy and indie-dance influences and songs about provincial discos, obnoxious people, masturbation and John Major, on Sarah Records. Though, come to think about it, probably not much odder than New Order having done a football anthem and a Balearic acid album. Anyway, if you're ever disappointed that New Order didn't record enough albums in the early 1980s, this CD is for you. The Age has a piece about 24 Hour Party People, the film about Factory Records which opens next week. It's interesting to note that Morrissey was meant to be a character in it but declined permission to be represented in the film. Well, tonight I saw 24 Hour Party People. It was quite good; perhaps a bit too cleverly self-referential for its own good in places (with all of "Tony Wilson"'s asides to the audience, for example, and the scene with the real Howard Devoto in the bathroom), though that's forgivable. Some good scenes there, though not as much Joy Division/New Order as I expected, and a bit too much focus on the Happy Mondays. Still, I'd recommend it to anyone who's into New Order or Joy Division, or who grew up listening to punk, new wave or Madchester baggycore. If that kind of thing means nothing to you, you probably won't get much out of this film though. BBC News has a review of 24 Hour Party People. Looks interesting.